One of the less visited district in Tokyo (esp for first-timers) is Odaiba (お台場), a shopping and entertainment area which Tokyo has plenty of. But since April 2012, there is an additional reason to drop by there. 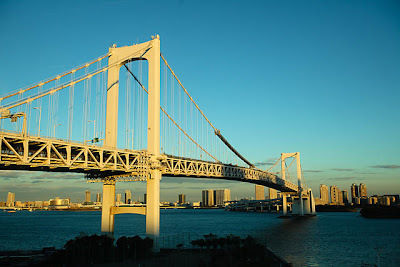 Odaiba is actually on a man-made island on Tokyo Bay. Created by huge landfills joining several small islands into one big one, it now has a futuristic and glitzy outlook so typical of Tokyo. Boasting of several huge shopping malls and entertainment complexes, it is a popular hangout for the locals. 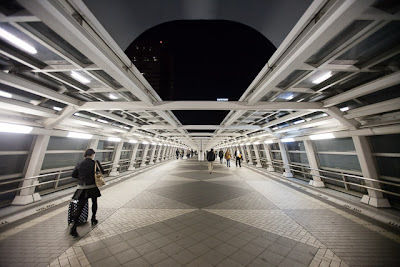 There are also state-of-the-art modern buildings like the Fuji TV tower and Tokyo Big Sight, the latter being Japan's largest exhibition and convention center. 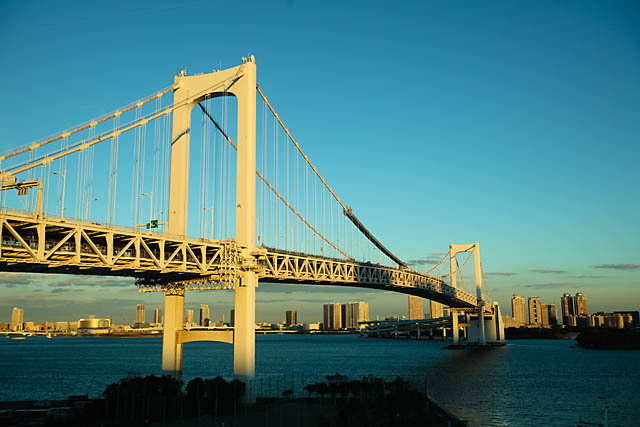 Connected to the rest of Tokyo by the Rainbow Bridge, reaching the island by public transport is easy with the Yurikamome train line. You could also drive across the bridge or even walk across, as there is a pedestrian walkway but the views along the way are great on the train line, since its an elevated line. 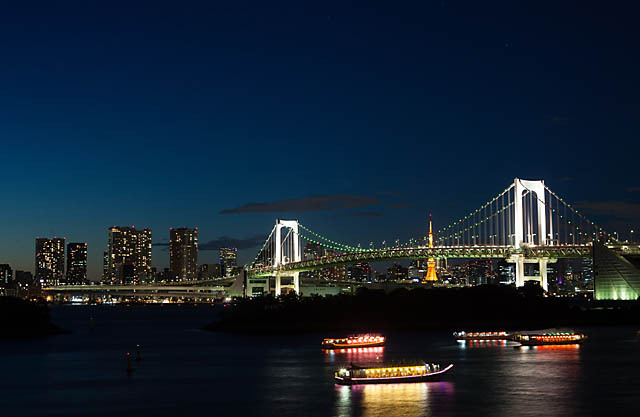 One of the primary reasons for visiting Odaiba is the beautiful view of the lighted Rainbow Bridge at night. On 19 April 2012, another entertainment and dining complex opened in Odaiba - DiverCity Tokyo Plaza. Its star attraction is the Gundam Front Tokyo, a shop/museum/attraction dedicated to the anime. And right in front of the building, is a huge "life-size" Gundam model And one that moves!!! 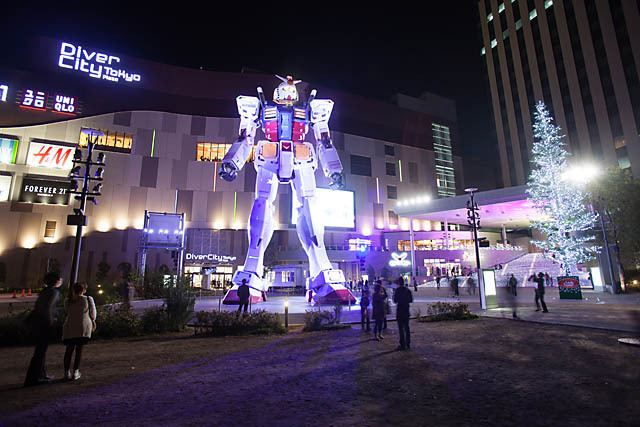 Three times a day, there is some light and sound "show" where the Gundam statue "comes to life". Before you get overly excited, the only part that moves is the head. While Japan is one of the most technologically advanced countries, a real Gundam I'm sure would make huge international news. 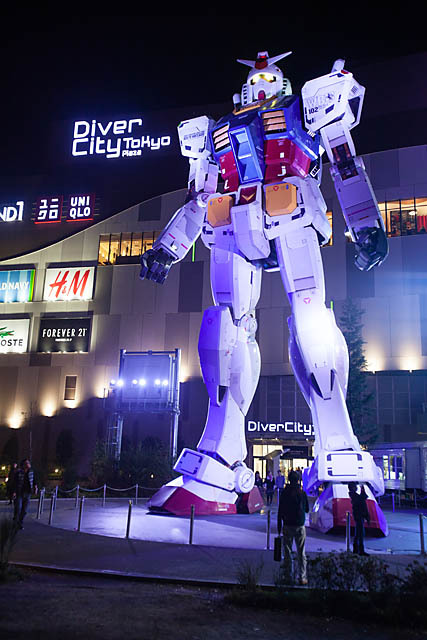 Nevertheless, for Gundam fans, seeing the 18metre statue would certainly make your day, and make your trip to Odaiba worthwhile! And in the shop in the building, there is a huge display of all kind of Gundam models as well. Check it out if you have spare time in Tokyo!